1. Slice Kangaroo fillets diagonally in to strips. Make a marinade using half the coriander and the sweet chilli sauce. 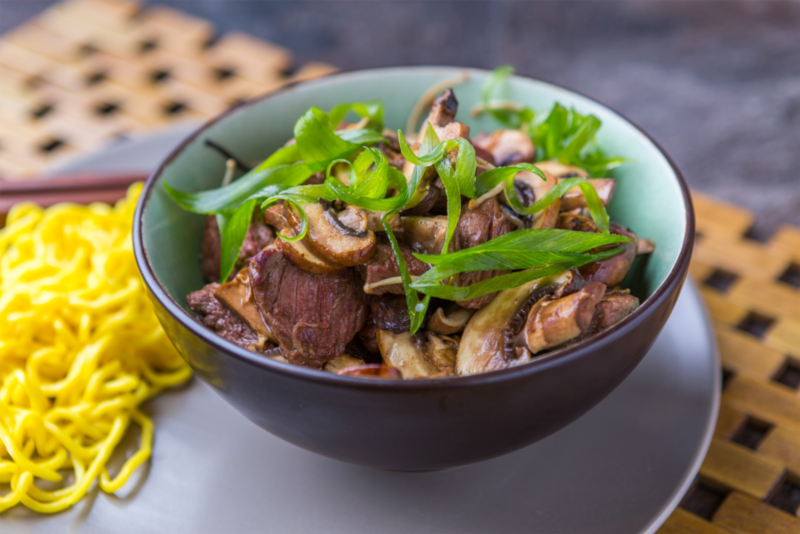 Put Kangaroo meat in marinade and set aside for 15-30 minutes. 2. Heat oil in a wok, then add onion, garlic, ginger and chilli and fry for 1 minute. Then add kangaroo strips and fry for 1 minute or until browned. Add, cashews, mushrooms, oyster sauce and fry quickly until heated through. Take off the heat; add pepper and a squeeze of lime. 3. Heat and pour a pot of boiling water over Hokkien noodles until al dente. Around 5 minutes. Serve stir-fry into bowl. Garnish with fresh sliced shallots & serve with Hokkien noodles on the side.